How to Make a Snowman Ornament. 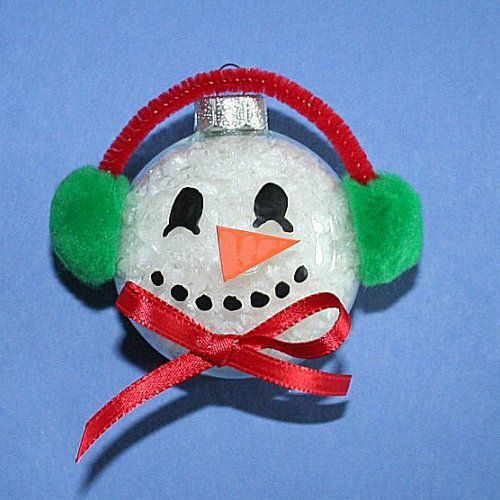 Find out how to create a cute snowman face using a clear, glass ornament. The above age and time guidelines are estimates. This project can be modified to suit other ages and may take more or less time depending on your circumstances. For best results, read through all of these steps before you start making this craft. Gathering The Supplies to Make a Glass Ball Snowman. Filling the Glass Ball With Snow. Use a simple kitchen funnel to fill the glass ball with artificial snow. If you cannot find snow, you can cut white plastic bags into tiny pieces. I would not recommend doing this to save money though, because a decent size bag of plastic snow is usually less than a dollar! Paint on the Snowman Face. Use black acrylic paint and a fine paint brush to add eyes and a mouth to your snowman's face. Adding the Nose to the Glass Ball Snowman. Cut a small nose out of orange craft foam and glue it in place. I added some dimension to my snowman's nose using a little bit of orange acrylic paint, but this is totally optional. Glue a Bow on the Glass Ball Snowman. Give your snowman a fancy bow for his neck using a piece of ribbon, cut about 12-inches long and tied. Add Pom-Poms to the Glass Ball Snowman. Glue two poms-poms onto the glass ball, directly across from each other on the sides of the snowman's head. Finishing the Glass Ball Snowman. Finally, cut a piece of chenille stem about 3-inches long and glue it between the two pom-poms so they look like ear muffs. Your snowman is now finished. Besides using this snowman as a Christmas tree ornament, you can display it on a table as is, in a fancy bowl among other glass balls, or hang it up in a window or other location using a small piece of ribbon.